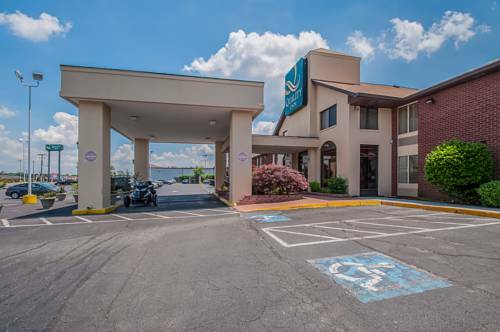 When traveling to Washington, DC for business on a budget, get more for your money at the Quality Inn near Potomac Mills hotel in Woodbridge, VA. Our affordable hotel is located south of the Beltway and near the Quantico Marine Corps base. To help keep you on your game, we offer access to fax and copy machines and meeting space for up to 40 people. Additional amenities include free WiFi and free continental breakfast. Unwind in your simply stylish guestroom, which is equipped with a microwave, refrigerator, coffee maker and TV with HBO. Some rooms include irons, ironing boards, hair dryers and a hot tubs. Also, earn rewards including free nights and gift cards with our Choice Privileges Rewards program. Pet accommodation: 20.00/night per pet limit 2 pets/room. Dogs & Cats accepted with signed pet policy. Safe charge $1.00 per night. $1.00 per night service fee for unlimted local phone calls. - Prince William Visitor Ctr.